After work the other day, I walked with a friend to a nearby café for dinner. After ordering, we each pulled out our laptops to get a little work done while we waited for our sandwiches. I pulled up my BEACON blog draft, eager to share some of the changes UW Biology is making to its introductory courses. The empty table next me was soon occupied by two students, who started quizzing each other as they prepared for a final exam. It was killing me! 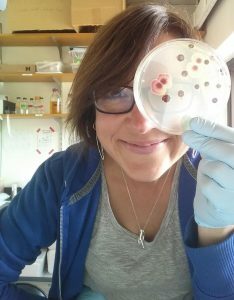 I am honored and excited to be part of a team of PIs, graduate students, and researchers who are seeking to transform the first two quarters of the undergraduate Biology experience at the University of Washington. With support from BEACON and an HHMI-funded grant awarded to Dr. Scott Freeman, we are creating a course-based undergraduate research experience (CURE) — a series of lab modules that provide introductory biology students with the opportunity to perform authentic research. Goals of our new curriculum include improving undergraduate students’ understanding of key evolutionary concepts and their ability to design experiments, while also increasing their emotional engagement with their learning, academic performance, confidence, resiliency, and professional identity. In the café, as I listened to the students next to me, they seemed committed, bright and knowledgeable; yet it sounded like they were memorizing and regurgitating material rather than learning. Although information was being exchanged between the students, connections seemed to be lacking. Did these students understand why the things they were learning and doing mattered? Or were they packing their brains full, only to dump the information after the exam? I thought about the pilot class I assisted with this winter quarter. The students ran an experiment based on experimental evolution of the bacterium Escherichia coli. Students explored the evolution of antibiotic resistance by exposing E.coli to various antibiotics and selecting resistant mutants. These mutants, along with a sensitive ancestor, were transferred daily in drug-free media for several weeks (Fig 1). During weeks the bacteria were being transferred, students learned and practiced R-based statistical analysis and data visualization — skills that they would use to interpret their experimental results. After ~3 weeks of transferring bacteria (over 150 generations of growth! ), the students compared competitive fitnesses and the minimum inhibitory concentrations (MICs) of ancestor strains to their descendant strains (i.e., pairs of strains from the beginning and end of transfers). Students presented their results at a poster session, where they discussed various topics such as the cost of antibiotic resistance and the nature of compensation. Figure 1: Lab overview for the first course in the UW Introductory Biology CURE. 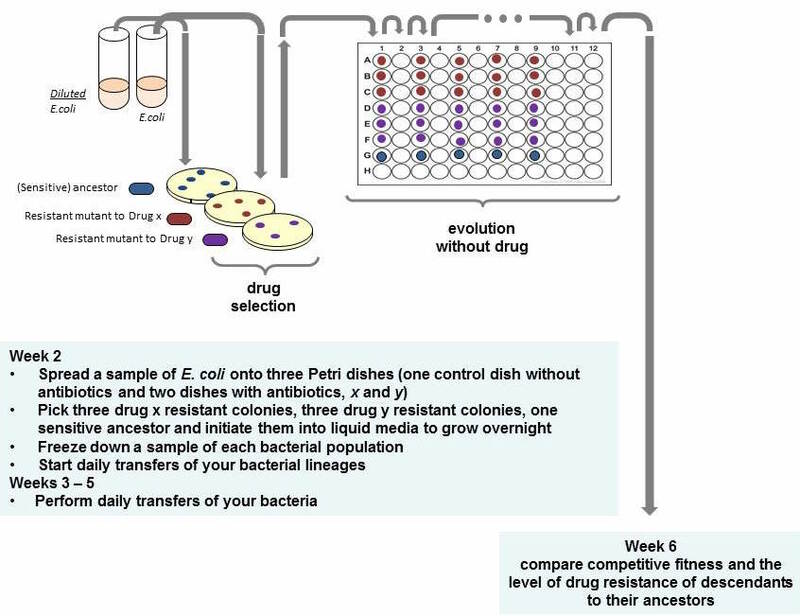 In the broadest terms, the lab involves (1) selection for drug resistant mutants, (2) propagation of these mutants and a drug-sensitive control strain for several generations in the absence of drugs, (3) assessment of competitive fitness and the level of drug resistance of all ancestors and descendants from the evolution experiment, (4) visualization and analysis of the data using R and (5) presentation of the research experience as a poster (Parts 4 and 5 not shown). As a follow-up to the winter quarter course, which highlighted evolutionary phenomena from a population level, we are offering a pilot course this spring, to integrate concepts from the cellular and molecular levels. In this second course of the Intro Bio CURE series, students will analyze the products of their own evolution experiments from the prior quarter. Students will sequence the relevant gene(s) of their sensitive and resistant bacterial isolates, look for mutations, and explore how those mutations change protein structure and cellular processes. In this way, the students will gain an understanding of the genetic and phenotypic features of drug resistance. They will present their findings in a poster session at the end of the class, encouraging synthesis of the material. Our goal is to enable students to trace genotype to phenotype at the cellular level, and connect evolution to molecular biology by linking phenotype to fitness. We also want to engage undergraduates in work that represents cutting edge science, potentially has applications for public health, and helps build their confidence and skills for high achievement in these and future science courses. We hope that the hands-on discovery aspects of the course will help students make connections and improve their understanding of evolution as a unifying theory that underlies all the life sciences. Figure 2: Instructor, Dr. Joya Mukerji, setting up lab for class. Dr. Mukerji is in charge of developing Course-Based Undergraduate Research Experiences for biology students at the University of Washington. My reflection on the pilot class was interrupted by the arrival of food. Despite my munching, I could still hear the students at the adjacent table. In addition to the biology final, one of the students had a statistics final coming up. She was complaining about not understanding the purpose of statistics and was glad to be getting the class over with. She was stressed because she had been struggling to find time to study while also commuting and holding down a full-time job. Hearing her concerns brought me back to another important goal we are aiming for in our course design: to improve the retention of undergraduates interested in STEM majors, with a particular emphasis on underrepresented minority students, women in male-dominated fields, and students from economically- and educationally disadvantaged backgrounds. The goal of infusing research into the introductory biology series is not “to weed out” students, but rather to ensure that all students taking intro bio are able to experience the excitement of doing authentic research. Often, apprenticeship-style research positions are scarce and are offered as unpaid internships, due to financial constraints. Factors like these make it particularly challenging for students from less-privileged backgrounds to gain laboratory experience. We hope that providing all UW students with a credit-bearing research experience early during their academic careers will lessen barriers to students’ entering STEM fields. In addition, students’ increased understanding of the real-world relevance of evolutionary concepts and the sense of project ownership cultivated via participating in the CURE may help reduce achievement gaps and enhance retention in the process. Partnering our BEACON grant with the HHMI-funded CURE experience has provided a unique opportunity for students to learn useful lab skills, better understand the scientific process, and explore experimental evolution in the context of a medically-relevant subject. As I finished my dinner, the students at the next table were trying to understand why bacteria have both “donuts and spaghetti” (plasmids and the chromosome). I decided maybe it was time for me to introduce myself…. Thanks to the amazing team of researchers who are making the UW Introductory Biology CURE come alive: Joya Mukerji, Scott Freeman, Ben Kerr, Peter Conlin, Kelly Hennessey, and Hannah Jordt. In addition, thanks to Luis Zaman and Chase O’Neil who have helped with the lab troubleshooting.